Warning: This review discusses some aspects of the plot. If Rian Johnson’s Brick, a superb debut that transposed the hardboiled patter of Raymond Chandler and film noir to the present day, made your brain moist, then you’ll be tickled black to discover that he’s recovered from his Brothers Bloom stumble and invested that pulp sensibility in Looper: a future-noir and quite possibly the best science fiction film of recent years. The circular plot, powered by time travel, forms an ontological paradox and consequently any attempt to pick it apart is likely to trap you in a self-defeating loop of argument as you valiantly attempt to straighten the line of action using crude tools like cause and effect. Johnson knows that his movie is the celluloid equivalent of a Chinese finger puzzle but all credit to him, he’s worked hard to close as many of his own loops, or plot holes to use the early 21st Century idiom, as possible, devising a series of rules to keep his audience on side and pre-empt hundreds of thousands of hours of senseless debate on Internet forums. For example, in a nicely layered first act, he establishes that effect, though it may precede cause, is not immutable; a character’s actions can still have an unknowable consequence: a prerequisite for suspense. We get a brutal demonstration when Paul Dano, one of the eponymous killers, bottles his contracted obligation to shoot his older self. Loopers have their victims sent back to them through time by the future mob; the ultimate in foolproof body disposal. The hitmen of the past get well paid for their trouble, but there’s a catch; their contracts demand that all future links to the illegal use of time travel be expunged. 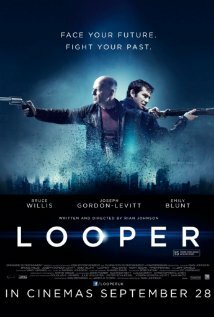 Consequently, if the Looper is still alive thirty years hence, they’re hooded, hustled into a spherical time machine, one of the movie’s many circular motifs, and sent back to themselves for on-the-spot execution; a novel form of suicide. Dano, playing the kind of whinging, wet blanket that he’s effectively patented since There Will Be Blood, recognises himself and balks at the task. The mob of the present, headed by future enforcer Jeff Daniels, responds by capturing the present day miscreant and dismembering him. Watching the future and formally able-bodied Dano succumb to a time-adjusted ripple effect, losing limbs before our eyes as he crawls toward a safe house, is a vivid, disturbing spectacle that sets the stakes for Joseph Gordon-Levitt’s flight from the mob in the second act. Similarly, the knowledge that changing events in the present, distorts and ultimately reshapes the memories of your future self, allows Johnson to maintain his time loop conceit without tipping the audience off too early as to what’s going to happen next. Bruce Willis may be blessed with foreknowledge, but once his younger self starts changing things, those memories become unreliable. Looper’s packed with clever get-outs like this, freeing Johnson to concentrate on the things that really matter: maintaining that hard-boiled mood and mining the set up for philosophical quandaries that translate into moral dilemmas for the characters. Certificate: 15 for Paul Dano's snivelling, time-amputation and child temper tantrums. Great review. I saw it this weekend and enjoyed it also, suspending disbelief enough to be entertained and to entertain the thought of what it would be like wrestling with the characters’ moral dilemmas. The other compliment I’d give it is it manages to be an original idea in the sci-fi/action realm, and wasn’t based on pre-existing material like a comic book, novel, TV show, etc. What a refreshing idea! There’s something tight and complete about a movie that was written purely as a movie for the screen, as opposed to having to adapt a 300-page novel and leaving out reams of scenes, conflict, inner thoughts and themes that leaves the resulting adapted movie feeling kind of like a blueprint or a shell of something larger and better.